Seriously friends, I decided to make a post just to talk about Puff Puff. Because, Puff Puff! This snack has been saving lives since 1900. It actually saved my life in my undergraduate days. Back then, to eat Puff Puff I had to buy it from the Puff Puff frying women in the neighbourhood known as,”Mami Achombo” in Cameroon. And I savoured every bite because each bite was just too good. So I had to learn how to make mine because I can’t carry Mami Achombo with me everywhere I go. She’s not MTN. 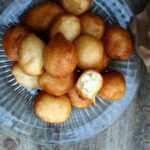 From lessons I have taken by observing my sister-in-law who sold Puff Puff for a living, to asking all kinds of questions from people who make killer Puff Puff, I have found the killer Puff Puff recipe. I published a “Puff Puff and Beans” post before which you can find here. In this post I want to dive deeper into the dynamics of Puff Puff. That way, anyone who reads this post will know how to make the perfectly delicious Puff Puff. Welcome to the university of Puff Puff making. Course in session: Puff Puff 101! It is a wickedly delicious form of deep fried dough that is eaten in a number of African countries. It is called Puff Puff in Cameroon and Nigeria. It called Les Beignets in French. 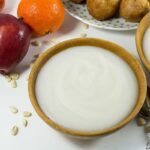 Ghanaians make something similar called Bofrot or Togbei. 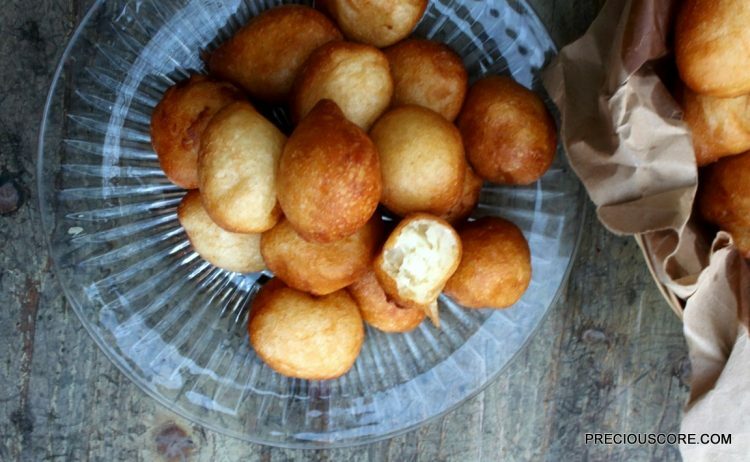 Liberians equally eat a form of Puff Puff called Kala and the Congolese call it Mikale. It is a star. 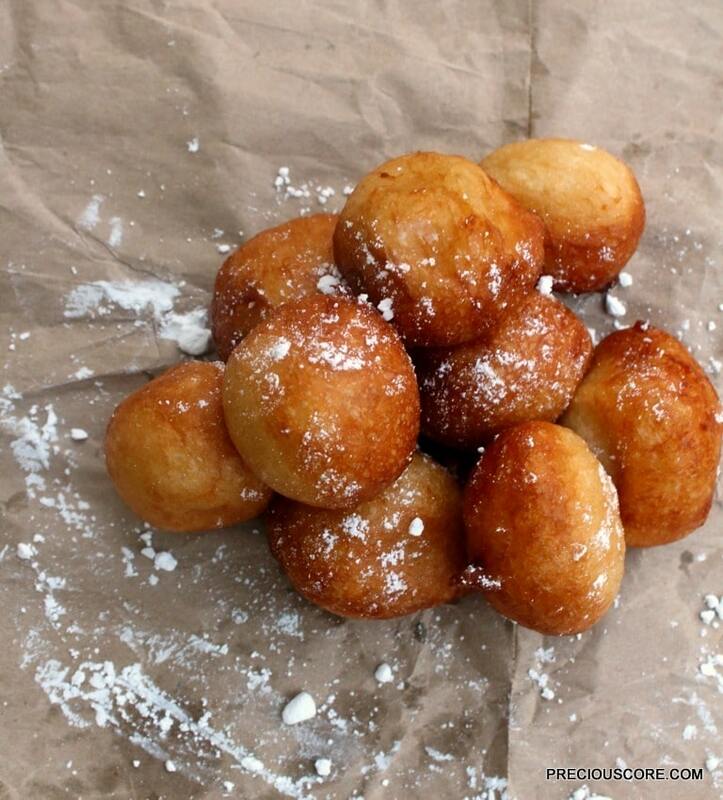 The basic ingredients used in making Puff Puff include flour, sugar, yeast, salt, water and oil for frying. In Cameroon, that’s mostly how Puff Puff is made. 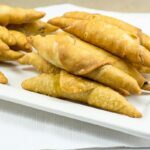 However, Puff Puff can be made with several other ingredients. They include nutmeg, milk, eggs, cinnamon, chocolate, coconut(!!!) and ginger if you want to ginger the swagger of the Puff Puff. Please forget I said that last part. The perfect Puff Puff should have a golden brown exterior. It should not be blackish. Secondly, it should have an airy interior. It shouldn’t be thick and dense on the inside. You achieve the perfect interior by using the right ratio of flour to water and yeast. (Please watch video to see the right consistency of the batter). Also you need to let the batter rise in a warm place for a considerable amount of time. This improves taste and texture. Thirdly, it shouldn’t be too sweet. 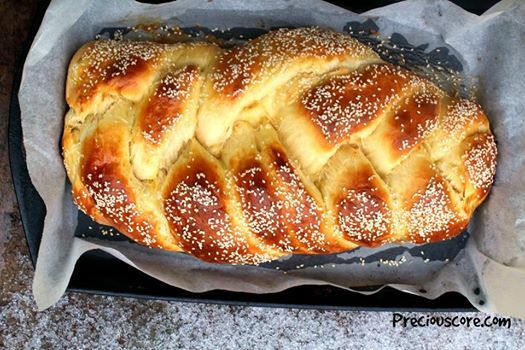 Puff Puff should be slightly sweet, almost a bread-like kind of sweetness. That allows it to be eaten with almost anything under the sun. Fourthly, it should be round in shape and not without form and void. Watch me making the perfect Puff Puff. Puff Puff could be eaten in a variety of ways which are either sweet or savoury. 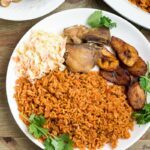 In Cameroon, it is typically eaten with fried beans and/or pap (a porridge made out of corn). 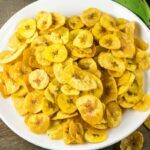 It could also be dipped in pepper sauce and eaten as a snack or an appetiser. Icing sugar could be sprinkled on top for a sweet option. And it is delicious when paired with tea. Oh Puff Puff!Why art thou so yummy? 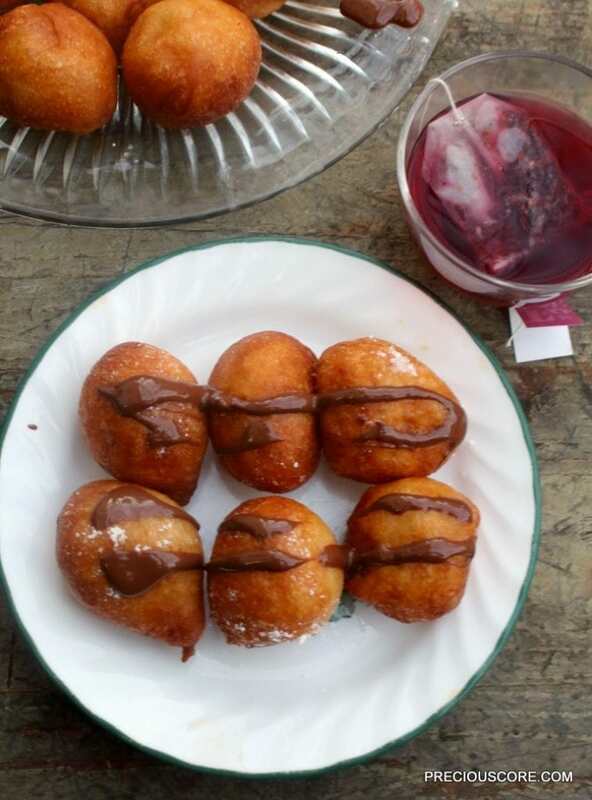 Puff Puff could also be filled with and drizzled with chocolate then eaten as a dessert. If you are a chocoholic, this will make you happy. You see, the puffpuff-bilities are endless. Hope you enjoyed my Puff Puff 101 post. Go forth and enjoy Puff Puff! How do you like your Puff Puff? I’ll love to hear your thoughts below. How to make the perfect Puff Puff! Mix yeast together with warm water and let it proof. It will look creamy and/or bubbles will form at the top. Add the sugar and salt into the yeast and water mixture and stir well. In a large bowl, mix the yeast mixture and flour into a smooth paste. Cover with a plastic wrap and kitchen towel then let the batter rise in a warm place for about two hours. Heat oil in a medium sized pot or wok on medium high heat for about seven minutes. Turn the heat to medium then grab some of the batter with your hand and drop into oil. It will form a ball (please see the video to see how this is done). Put in enough batter just to fill the pan but not to overcrowd it. When one side turns golden brown, flip to the other side to cook. When the balls are golden brown then they are thoroughly cooked. Remove and drain on paper towel. Enjoy warm with tea or any way you like. 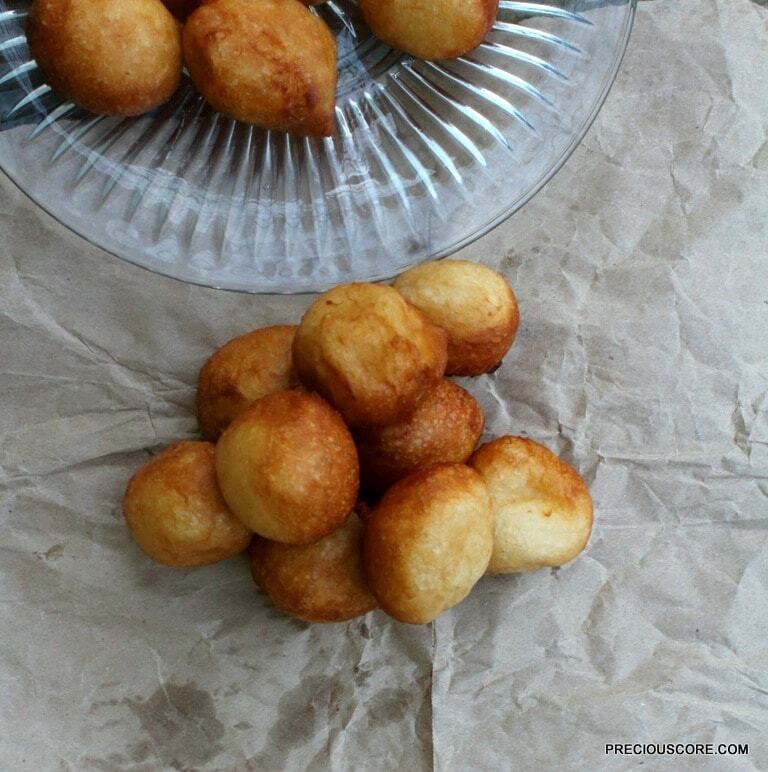 If you make this recipe, please tag me in your Puff Puff photo on Instagram @preciouscore. I love drooling oer pictures of food! Puff n chilled pepsi, combo made from heaven. I like puff puff a lot but don’t get to eat it everyday. Thanks for tormenting me with the pix Precious. Bola, you always have the coolest combos! Sowie for the ‘tormentation’. I can play with my food, with my anything really, but don’t you dare touch my puff puff (same with my grilled chicken or my BBQ fish). I had to learn how to make puff puff few months back o, my love for it is too strong to be reaching bus stop everyday because of it. I’m with you on this, Ima. Don’t touch my Puff Puff! Hahaha at ruining your Puff Puff dreams. I can sense your passion, Chidinma. There’s nothing like hot fresh Puff Puff! That’s my go to snack immediately after Church on Sunday’s. As in sometimes I dont even reach home before I start stylishly eating it in the car or Taxi. And it’s cheap and affordable too. For some reason I don’t like Egg Buns. I prefer puff puff. The hotter the better. Hahaha Bisi, I used to always steal bites of my Puff Puff or Akara before I get home. Just couldn’t wait for it to get cold. Thanks Joseph! They’re not cookies though. Yummy! Love the name – Puff Puff. Too cute! Wow @fried beans and/or pap. We make puff puff back in Nigeria but we just eat it like that or stepped down with juice or a cold drink. I’m surprised it can even be eaten with beans or pap. Mind me asking how that tastes? Hahaha Itunu I hear you dear. With beans and pap it is savoury and sweet. That combo makes for a complete meal. It is so good! Oh man, these looks so delicious! I think I may have to try them! I enjoy puffpuff a lot. I’m getting some immediately I leave where I am at the moment. I’ve actually not tried it because it consumes a lot of oil and school life requires management of almost everything. Awww I can imagine school life dear. Hope you get a chance to try it later. For the love of puff puff! My best is hot and crispy straight from the fire. I really need to learn to make it one truly cannot carry it everywhere like MTN. Haha I tell you, sis. It is worth learning! Okay i just tried mine for the 1st time but its a bit harder/stronger than it supposed to be on the outside. Dont know what went wrong though i used a seedy kind of yeast and flour u bought from the market. Please do you know what i did wrong? Hi Paula, so sorry I missed replying to your message months ago. Is it crunchy at all on the outside? It could be that it stayed too long in the oil. The longer it stays, the more it hardens. If you followed my exact measurements it should be fine. Your yeast and flour sound okay! Our measurement is quite different. How many ml is your cup. Us is 250ml. If possible your description should include grams and ml. Because measurement is not the same everywhere. 1 cup equals 125 grams. I’ll definitely update to include measurements in grams. Thanks for the suggestion! That combo is the truth, Harriet! I’m always so happy when I make some at home. Thanks dear. Precious dear thanks very much for this recipe. For once in my life l succeeded in making puff puff. I didn’t have normal flour in the house except for whole grain flour and i went ahead and use it but added a little bit more water because the flour is heavier than the usual one. Thanks again my Cameroon sis. Wow! So happy to hear that, Beatrice. Thank you for sharing. Hi, I’m not sure I understand what you mean. Do you mean the measurement for a small quantity of puff puff? Thanks for the info, Joyce! First off….Thank you so much for sharing. I’m sure you can tell by my name where I’m from (haha). I love everything you do and please never stop. I always tell myself I’m gonna start cooking beignets and ndole but oh Lord.. with the help of these videos/blog I don’t have an excuse anymore! Anyways, this is the best blog EVER and I’ll be honest I never thought anyone could come up with such an awesome idea than to share and spread the food we culturally eat all the time and make it so simple. I really hope I can master this and hopefully share it here in the States for people to enjoy. Thanks again you’re a QUEEN! Awww thank you so much for these sweet words, Getraud! So glad you found me and glad that you feel blessed by my blog. Please let me know how it goes when you try a recipe. I just mixed puffpuff using your recipe. I hope it comes out like yours…. will let you know. Thanks for sharing. Prepare them the same way then when they are cold, place them in airtight bags or containers and keep in the fridge. Lightly warm in the microwave to freshen them up before serving. It’s good to warm about 8 at a time for 1 minute on high. Note that if you heat up puff puff for too long in the microwave, it will become hard and basically inedible. Hope this gives you some ideas. I enjoyed this recipe. I love puff puff a lot. I used to buy it from mami Achombo back then in Bamenda. Pls Precious, what quantity of yeast is suitable for a 3kg flour? Hi Angela, glad you love the recipe! Use 3 tablespoons of yeast for that quantity of flour. Previous, I’m a puff-puff diva now at home. Thanks for the recipe. I wish I could send you pictures! I love testimonies like this! Thanks for the feedback, dear.